Many people live in small homes or apartments and feel crammed like sardines in their interior living space. As tiny eco-friendly homes continue to gain popularity, more and more people are looking to outdoor spaces to expand their available living areas. But how do urban dwellers, townhouse owners or homes with teeny lots cope with a small outdoor space? For savvy residents, they make changes to maximize their cramped patios and yards. Here are some ideas for maximizing your tiny outdoor area and making that small outdoor space feel large. One idea for turning something that feels cramped and small into something great is by changing the color. The general decorating rule is to use lighter colors for small spaces, which works remarkably well inside as well as in those small outdoor areas. However, if you like dark colors, there are still ways to create a comfortable space if it is small. The trick is to create depth with color. You may choose to do an accent curtain in a darker hue in your small outdoor space, or you may find a color that, although dark, also adds depth to the area and moves the confines outward, creating the feel of openness. Style Idea: Light colored throw pillows and white patio furniture can give your small patio a grander feel. Remember when your exterior square footage is limited; you may still have space to go upwards. Building up means utilizing space is a smart manner, and you may suddenly realize you have more space than the average homeowner. 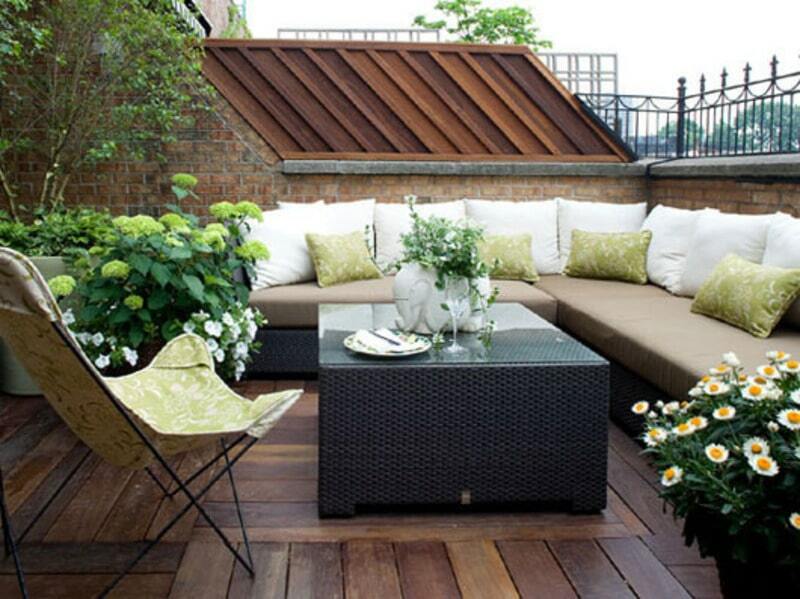 Consider adding a rooftop terrace or building an elevated deck in your small outdoor space, if applicable. If you can create an outdoor porch on the roof, this will give you space for entertaining when weather permits. The entrance to your outdoor space can be the backdoor from your house. If you need another path, you just need to make sure that the area is wide enough, comfortable, and safe to pass through. The surface must be flat. But, this should be true not only for the entrance but the whole area. You do not want to see accidents happen since this place can be used mostly by kids who are playing and running around. To maximize the small space available to make an entrance, use doors that can emphasize the area. Whatever type of door you use, make sure that it will be able to accommodate several people. You should not include small fixtures. They might only look awkward in your garden. Rather, you can have appropriately sized chairs, tables, loungers, etc. to give you more comfort. What you need to avoid, however, is using bulky and oversized items. They will be the only things that will occupy the area giving you that crowded feeling no matter how much space is present. If you can, sacrifice a few things to give way to more important items in the small outdoor space. You can forego having a pond or a fountain so that you can set up a garden table. The table can have many uses as compared to the pond or the fountain so you can prioritize having that. Maximizing space does not necessarily mean filling up each and every available area. But, it means increasing the effectiveness of the area. So, if you are thinking about throwing a party there, you will be able to accommodate your guests better. When you have decided on what furnishings and fixtures you are going to include in your small outdoor space, you can now position them appropriately. To maximize that space that is given, make sure that you do not just dump them in one corner. Placing them at the center can work. But what is better if you can scatter them. Introduce plants as you have a lot of choices. You can have only a small plant to be able to display it in this space which is not necessarily huge. But, you can also opt for a big plant if you have a large bare area on your outdoor space. Planting grass and varying the plants that you place there will also make the area look more suitable. Grass will span a few meters. Then, you can plant a certain type of flower in a certain place to disturb the continuity of the grass. Remember that when you have a huge space occupied by the same thing, which in this instance is grass, the place will look even larger. Proper lighting will also help. You can light all of the space. But, remember to choose a few areas to emphasize. You can have colored lighting and spotlights to make this happen. If you want to enjoy some good time with your family in your small outdoor space on a soothing summer evening or host a barbecue party at your garden on a winter night, you should consider buying chic outdoor furniture. 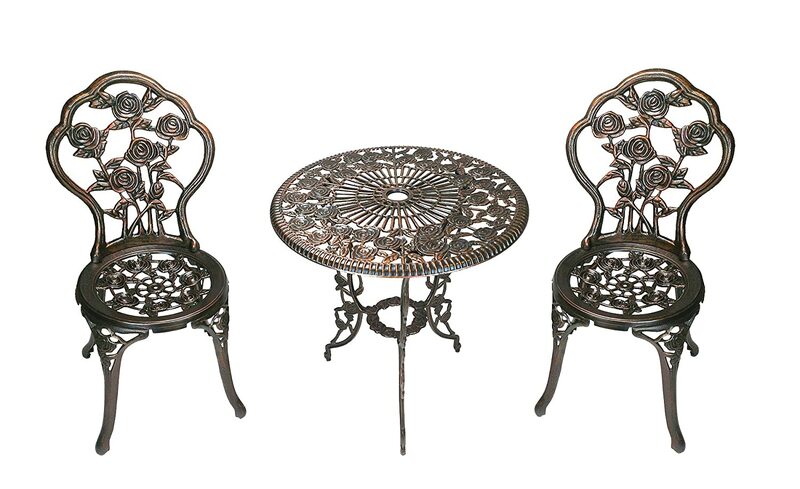 Different types of outdoor furniture are available for every style, be it vintage or modern. You should first determine what type of furniture you need and then find a reliable outdoor furniture supplier to get the product you want. You should reach out to a reputable outdoor furniture dealer that would provide you with top-notch, long-lasting items. Designer furniture is a craze now. If you want to keep pace with the times, you can get in touch with a premier designer furniture company and order the product you want. The products of a well-known outdoor furniture agency will not only enhance the look and feel of your small outdoor space but will also reflect your refined taste. You will be astonished to find the wide variety of outdoor furniture in the treasury of the reputed designer furniture agencies. The most common varieties include wings, benches, garden chairs, hammocks, and picnic tables. 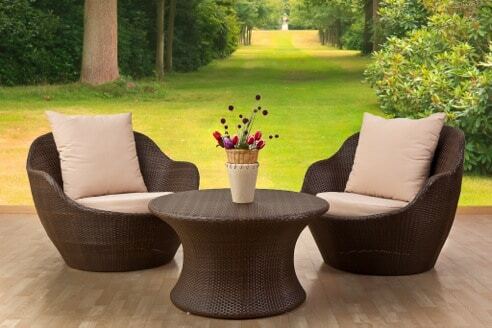 The outdoor furniture is made of different types of materials including teak, cast aluminum, rattan, and wicker. The material you select should suit the climatic conditions, landscape, and humidity of the location you live in. Before buying the furniture, you should also take into account how much you will be using it. Try to find out if you will need to use the furniture occasionally or for all the year round. Before purchasing furniture from an outdoor furniture store, try to imagine how your small outdoor space will look with furniture. You may use the layout to evaluate if the furniture you choose will fit the outdoor area properly. Make sure that the furniture you buy is adequate for your space, and it does not crowd the area. There are even apps you can download to design your garden space ahead of time. If you have a larger amount of space in your outdoor area, you can consider having lounge beds that you find in many top-class hotels and resorts. The lounge beds are not only sophisticated and stylish, but they enable you to stretch yourself out and relax under the sun. If you often hold parties in your outdoor area, you can consider buying small dining tables and chairs that would not only be highly functional during the parties but will also enhance the look and feel of your outdoor space or garden area. 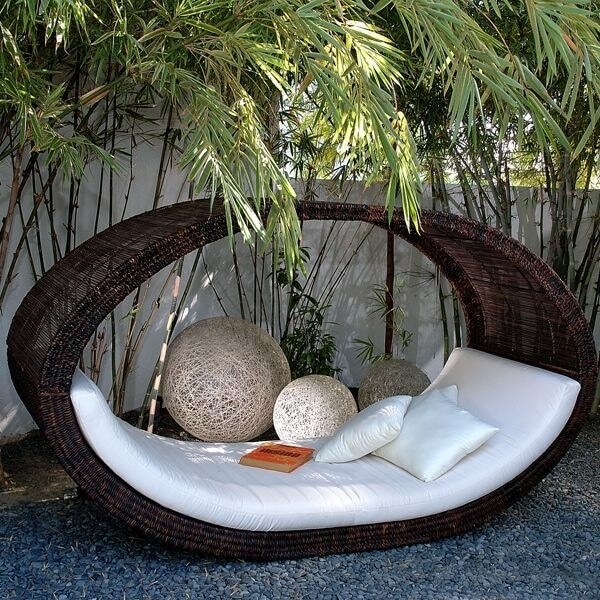 For poolside entertainment, you can think of buying a ‘Pod’ wicker daybed. It is not only comfortable but looks fantastic. It is available in a variety of shapes. Go through different pieces and find out the one that looks the best in your small outdoor space. In this age of technology, it is possible to order designer outdoor furniture online. Before buying furniture from a designer furniture company online, make sure that the provider is reliable. You should check the websites of these retailers and find out the types of outdoor furniture they have in stock. Compare the prices of each of the retailers and find out the one offering the best deal. The outdoor living space has been a favorite place to have fun with friends and family or just bask in the Sun. Over the years there has been a drastic change in the trend of outdoor furniture. Gone are the days when the colorful plastic or web loungers and chairs were the only furniture options for lawn or poolside sitting. In addition to these, you can now find many new innovative materials used for making outdoor furniture that gives a fresh look to your backyard. For people who like to keep it simple and comfortable, resin is a great choice for your small outdoor space. You have the option to pick from a practical list of furniture like coffee table, chairs, footrest, and table. Resin outdoor furniture can withstand the vagaries of changing weather, but at times it has been seen that the color of the furniture has a tendency to dull or fade a bit over a period. If panache and glamor are what you want to incorporate to your small outdoor space like a patio or backyard then, the contemporary outdoor furniture is where you should look. You can find innovative, comfortable furniture pieces like loveseats to create some cozy moments with your special person, couches or bar stools to share a light moment with close friends. There are mind-boggling designs to choose from. The most popular materials are glass, aluminum, and steel. The best part is that this furniture is it can provide you comfort that can be matched to leather sofas. Like all good things, this range of outdoor furniture comes with a steep price tag, but the investment is worth it. When you are out shopping for outdoor furniture, try to find out stores that deal exclusively in this category of furniture. It is here you will find the latest designs for your small outdoor space. Shop during Spring as the best time as the new designs are usually launched during this time of the year. If you want to make the most of your budget then fall is the perfect time to shop as you will get great deals. Loosen up and think out of the box when you are planning your outdoor space as this is the only space in your home where you can experiment the most. You can go wild and pick some bright colored furniture to make the place lively or just pick some interesting designs to give the space a glamorous touch. Outdoor space is special as this is where you unwind and bond with your loved ones. 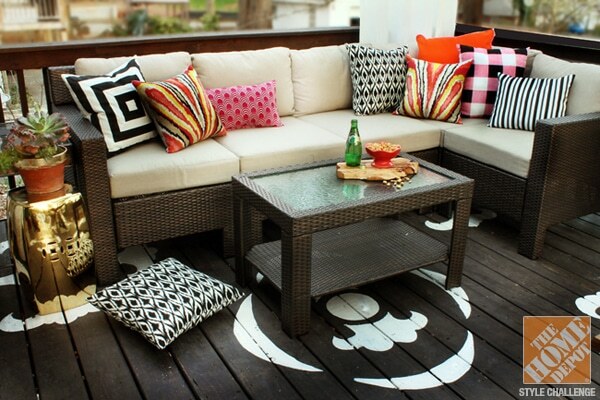 So, create a fabulous and comfortable outdoor area with some interesting outdoor furniture and have fun! Sometimes it is hard to find furniture that is properly scaled to a small outdoor space while offering the versatility and function of a larger piece of furniture. However, here is one piece of furniture that you will be happy to include in a smaller living space: A scaled down sectional sofa. With all of the versatility of its larger cousin, the smaller sectional can create a great conversation area in the backyard. Whenever you are setting an outdoor space, you need to be aware of the scale of the patterns and furnishings that you are using. Typically you want to keep your outdoor scale smaller for just to keep it looking balanced. This is where a small sectional can be a lifesaver. Not only is it the proper scale for a smaller space, but it also offers variety to your seating arrangements. While a standard sized sectional can very easily overpower a small space, using a scaled down version of a sectional in the same small space works perfectly. You may decide to set the sectional up as a single sofa, or you may decide to break it into smaller conversational groupings. Like most furniture, small sectionals come in just about every style under the sun. You can find ones that are split in two, ones with corners, others with round edges, and pretty much any configuration that you can imagine. One of the great things about a sectional is that you can arrange it any way that makes sense for space. One thing to remember with the smaller sectionals is that you will want to keep your upholstery in the same scale as your backyard and the furniture. Avery large print will look off balance and out of place in your backyard as will a very tiny and busy print. Keep your prints on the smaller side without becoming microscopic. You can set your sectional sofa up in a corner, conversational grouping, or you may opt to set each section facing each other and parallel with a coffee table in between. You may also want to create two completely separate conversational spaces with your sectional and relate them to each other with an area rug. Planning an outdoor living area in a location with particularly nice weather is an incredible opportunity. In some of the more hospitable climates, one can practically live outside year-round, and outside spaces truly become extensions of the inside of a home. Creating a truly exceptional design for these kinds of climates requires a lot of creativity and ability to think outside the box and see what’s truly possible when the weather cooperates. A popular thing to put outside is a small outdoor kitchen. A lot of people across the country have a little barbecue grill; only those with the nicest weather get full use out of a kitchen complete with small barbecue, stonework counter, burners, refrigerator, and sink. This kind of small outdoor kitchen is a magnificent statement piece when placed in the context of the rest of the yard. 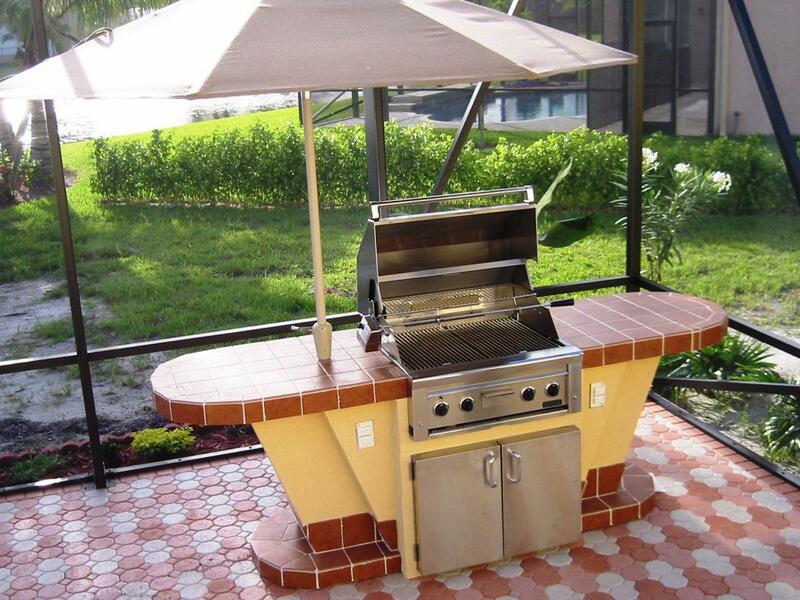 There are many varieties of outdoor kitchen available, and of course one can always be custom created. Even in the nicest climates the nights often turn chilly. Installing a fireplace combats the cold and makes a very effective focal point at the same time. The design of these units can be custom or prefabricated, of real stone or of a specially designed heat-absorbing compound that mimics the appearance of stone. Fireplaces can also be incorporated into a larger design as needed. Ponds and small lakes can add drama to an outdoor space with less maintenance than a pool. If you choose a running water feature, it is partially self-cleaning, and if you populate it with fish, it becomes even more self-sufficient. If your landscape architect and contractor don’t have sufficient experience, bring in a consulting expert who does. If you love water, it’s probably worth it. Many people are looking for some fresh outdoor kitchen ideas that can help turn their plain old backyard into a luxurious dining and entertainment area to be enjoyed by their friends and family. There are many different things one can achieve using the following outdoor kitchen ideas as inspiration. Many people create cooking spaces outdoors and whether you have a small charcoal grill or a totally tricked out gas monstrosity, be sure you treat it the same as you would an indoor kitchen. All of the cooking precautions you follow indoors need to be followed in the outdoor space. Also, remember how to handle foods to prevent illness properly. Just because you are cooking outdoors does not mean that co-mingling meats and other foods are not dangerous. Follow all of the usual food health precautions. It’s a common outdoor kitchen idea for a small space in the backyard. All one needs to call a space a kitchen is a way to cook and entertain. A barbecue grill is certainly an excellent way to achieve this goal and one of the most affordable too. Besides, grilling up some hamburgers and hot dogs and spending some quality time with friends and family is a favorite summer activity among many Americans. Barbecue grills come in various shapes and sizes, but there are only a few varieties to choose from. There is the basic charcoal grill which is a very popular choice among backyard chefs and grilling enthusiasts alike, due to their affordability and the unique flavor that only charcoal can provide. Another popular choice is the gas grill due to its convenient ability to provide a perfect grilling temperature in a matter of seconds. A smoker is another popular type of grill that burns wood at low temperatures to slow cook the meat over a period of several hours – giving them time to absorb the rich, smoky flavor that wood provides. Different types of wood can be used to alter the flavor. If one will be going to be spending a lot of time cooking outside, they may want to consider one of the most functional outdoor kitchen ideas and surround that fancy grill with some counter tops, some cabinet space and perhaps a sink to help keep things nice and tidy. This kind of setup will eliminate the need to constantly run in and out of the house while cooking in the backyard. Also, countertops can double as dining tables in situations where space or seating arrangements may be limited. Fire pits and fireplaces are also some of the greatest outdoor kitchen ideas as they are a fun way to turn a backyard space into a relaxing centerpiece where everyone can gather around and enjoy each other’s company. Fire pit and fireplace design range from a simplistic campfire type of setup to some of the most elegant craftsmanship one could imagine. Much like grills, fire pits, and fireplaces come in charcoal or wood and gas burning varieties, and they can either be a free-standing unit or fabricated using metal, stone, glass, and a variety of other types of nonflammable materials. 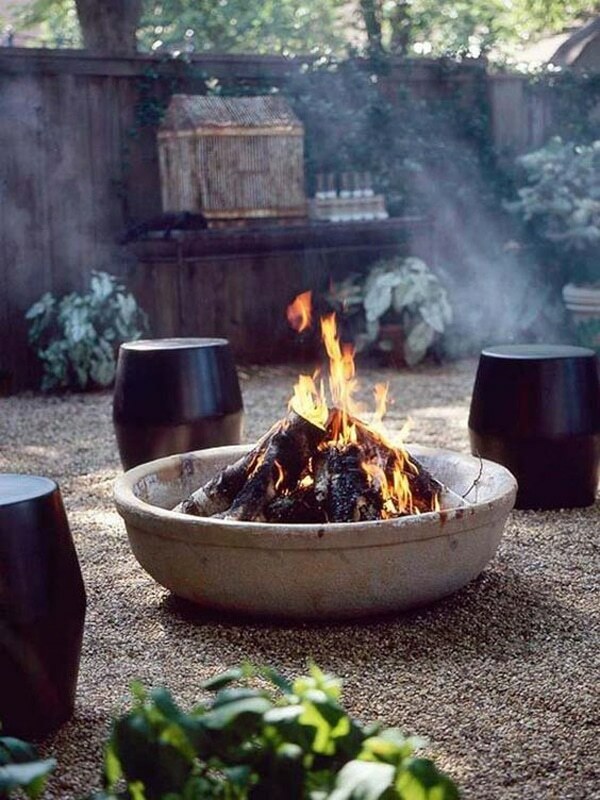 The difference is that fire pits are an open design and fireplaces are usually closed off on all sides except for the front opening, and they usually have a smokestack or chimney that is used to funnel the smoke away. Regardless of the homeowner’s personal tastes and preferences, contracting a professional is the best option for making the most out of an outdoor living space such as this. If you have an outdoor wooden swing set that sits in the direct sun, finding ways to provide shade to the area may be a concern. Too much sun is a health issue for any of us, but more so for children. Not only does sunburn cause skin cancer and facilitate aging, but play equipment can also get dangerously hot when exposed to constant direct sunlight and heat. Most of the larger wooden play sets come with decorative tarps to cover the decks where children sit and play. These are designed to help reduce exposure to the sun, but over time these tarps become worn and brittle from exposure to the elements. Because these tarps are designed to shade the children while they are playing, they should be replaced when necessary. Even if your play set does have a cover, it will not shade the whole area. There are several options available to shade an outdoor play area. The easiest and most obvious of these options would be to place your playset in the shade of some beautiful trees. If trees are not an option you could consider outdoor tents or large tarps. Which Is the Best Option for a Swing Set? There are a variety of inexpensive outdoor tents but, most of these tents are not meant to be left in place, and the support poles and material are not usually strong enough to hold up against the outdoor elements. These inexpensive outdoor tents and gazebos are designed to be put up and taken back down within a fairly short time, and they probably would not be large enough to cover a large wooden playset. If you are thinking of using a tent to shade a large swing set or backyard play area, you will probably be disappointed. Most inexpensive, general use tents are designed to be tall enough to stand under and are intended for short-term entertaining or relaxing in the yard. An outdoor wooden swing set is much higher than you are and will also have an area around the structure where children will be playing. Using a tarp to shade the play area is another alternative that will probably not work. Once again, the issue of finding a way to anchor it around the swing set will be a problem. Deciding if the tarp is to be attached to the swing set and where and how to anchor it beyond the set are probably the biggest drawbacks. A tarp hanging over the swing set may also create an eyesore. Another alternative for creating shade around an outdoor wooden swing set, or any other play area is to plant trees around the area. Trees can be slow growing and will drop leaves and debris in the spring and fall. There are a variety of trees that are fast growing and will provide plenty of shade as they mature. Planting trees will probably not provide much shade right away, but fast-growing trees could provide plenty of shade in a few short years. Having a big space on your backyard leaves a lot of room for creativity. The challenge lies in transforming this idle space into something that is useful and pleasing. Endless possibilities await you once you open your imagination. The first thing to do is come up with a plan; create an image of how you would like to see the outdoor to look like. A popular choice among homeowners is the construction of inground pools. This is a great way to maximize free space and at the same time, own a piece of investment that can be enjoyed by everyone. Finish it off by adding a few pieces of patio furniture around the area that will surely add flare and create a relaxing atmosphere. Designing your outdoor can be fun and exciting. You can mix a couple of modern ideas to touch up the look of any space. In choosing the furniture that is good for your patio, choose designs that reflect your personality. Contemporary pieces are great for houses with a modern twist, a splash of brightly colored tables and chairs can brighten up your backyard. Furniture made with dark metals and wood is a popular choice because it is easy to clean. If you are going for a minimalist look, avoid designs with too many frills and lines. Another great idea is to invest in a good quality outdoor grill. Match this with a built-in bar, and you got yourself the perfect spot to hold family gatherings and parties. Lastly, you can create a themed look for your patio by buying a few decors and accents such as scented candles, pillows, chair cushions, and flowers. Placing a few lanterns and outdoor lights can also set the mood for a quiet evening. Choose items that will complement the design of your house in its entirety, and at the same time, it can be a focal point once your guests set foot in your backyard. Finally, remember your family pets. Outdoor spaces are a lot of fun for the animals in the family, but you have to keep them safe from injury and harm just as you would the human members of your family. Another consideration is preventing wild animals from invading your outdoor space. Create deterrents that will keep animals like raccoons, moles, mice, squirrels, and rabbits from causing harm.